Upgrade Kit Coupon - Now What? the kit coupon is not a discount to buy a printer, is ti buy just the parts to upgrade for those who have already a printer. The upgrade kit coupon is only there for existing Flux Delta owners to get most of the improvements of the Delta+. The best option was to get in during the early-bird period, and stack the FLUX Friends discount on top of that. Which printer do you already own? 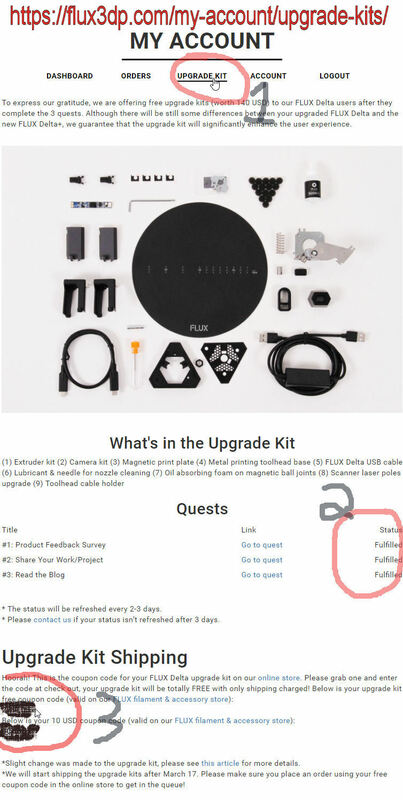 are trying to order the upgrade kit (NOT the Flux Delta+)? 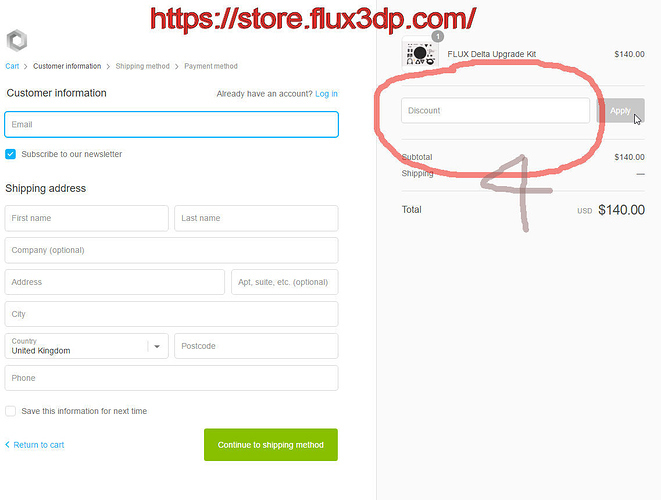 Do you have the discount coupon listed at the bottom of the Upgrade Kits section of your flux account (looks like the following screenshot)? You should have the two coupons, the first of which you enter when purchasing the Upgrade Kit in order to pay only for the postage. The second coupon is there because the new metal base plate is no longer in the kit due to quality control issues. Yes, I have exactly re-read, as indicated in your list, but I still have not received anything … no coupons and I am french, not bilingual so it was hard enough for me to answer questions …Maybe I have to wait a little longer …? Thanks for confirming that… my apologies I can’t write it in french to assist! How long ago did you finish the quests? It took two or three days for most people to receive theirs as far as I know. Did you check the flux account link I mentioned earlier, as that is where the coupon will be shown. It isn’t emailed to your or anything. Hi Harlock95, do you see the word “Fulfilled” at step 2 in pictures? That is great news @Harlock95 glad you got it worked out. Don’t be such a stranger, visit us more often. 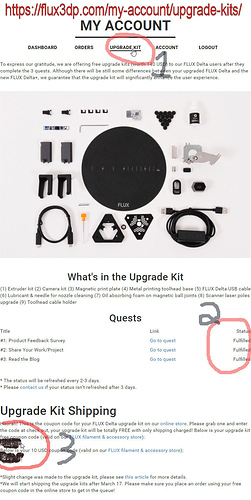 Has anybody received a confirmation, that the upgrade kit was sent? I did not hear anything since i ordered it two weeks ago. Did anyone add the new 2017 toolhead to their order? I missed seeing it when I ordered. No confirmation of anything yet. There were no toolheads in there when I ordered. Just the upgrade kit, the old metal plates and the filament specials.